Any person in the modern world can tell you just how vital brunch is to their daily productivity. Brunch is basically the combination of both breakfast and lunch eaten either early in the morning or late in the afternoon. With people having unique schedules and sleeping patterns, brunch is an essential part of their day. More and more cafes and restaurants now have a special menu to cater to brunch-lovers; and some events also serve brunch meals. Thus, a great menu design is needed to make brunch even more appealing. What we’ve got are simple yet highly sophisticated high quality designs to use for your own brunch menu. Take your pick from our sample menu designs to create a unique design for your brunch menu. Download our free and premium designs now! 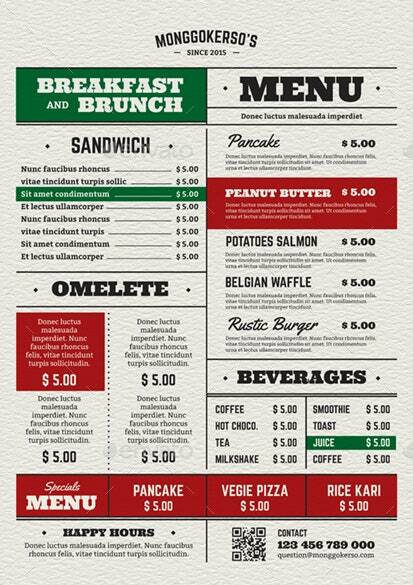 Download this Urban Brunch Menu Design for your modern cafe. It has a clean layout with appealing illustrations to match. This template will provide you with 2 color variations to choose from—black and white—graphic illustrtaions, and an easy to edit text layout. A lunch and breakfast menu template you’ll surely want to have is this Floral Brunch Menu Design. It’s got a minimalist text layout with an intriguing watercolor background in neutral tones. Get this brunch menu template for your garden cafe, girls brunch out, or your special corporate event. 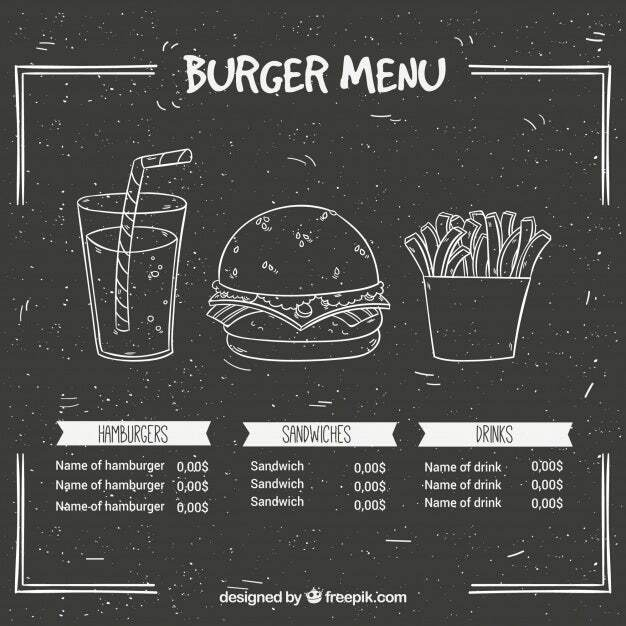 If you’re looking for a cool chalkboard menu template, this Burger Brunch Menu is one for keeps. Download this vector template for an authentic chalkboard look with fun illustrations and a clean text. You’ll never go wrong with this Vintage Breakfast and Brunch Menu. A vintage brunch design is always a bold and creative choice. This one in particular makes use of awesome vintage typefaces and iconic illustrations to look authentic. The luxurious and post-modern establishments will definitely love this design. Download the Modern Jungle Brunch Menu Design to amplify the summer vibe in your posh cafe, restaurant, or themed event. Pizza is also one type of brunch meal loved by many. 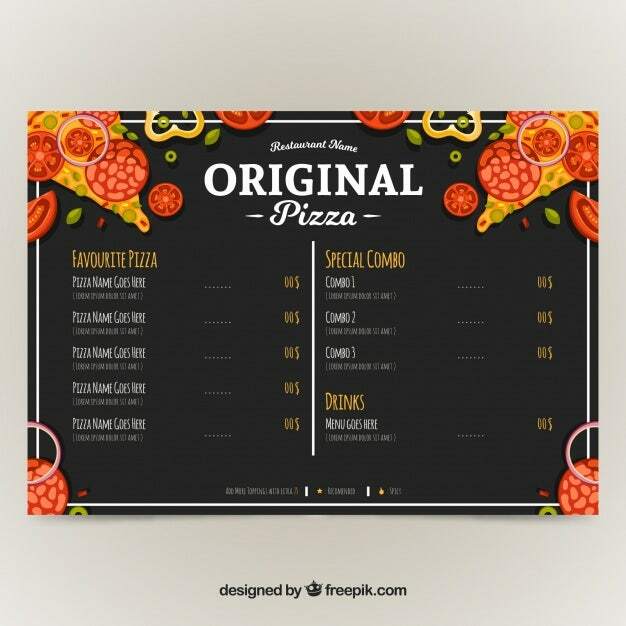 Download this Original Pizza Brunch Menu for free and easily customize it to fit your own menu. It’s got eye-catching colors and fun illustrations to entice customers to order more pizza. Looking for retro cool among sample breakfast menus? 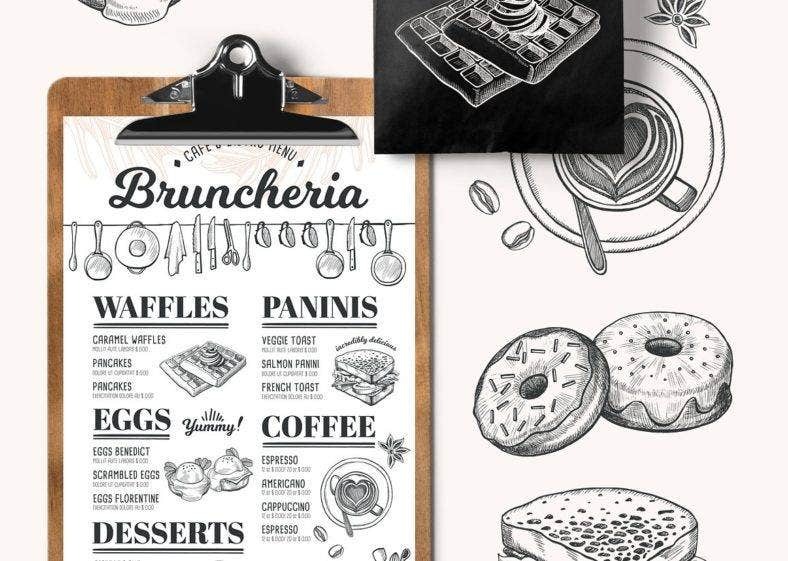 This Retro Breakfast and Brunch Menu Design is up for download. Get this easy to edit and high quality design for your retro-themed cafe or party. 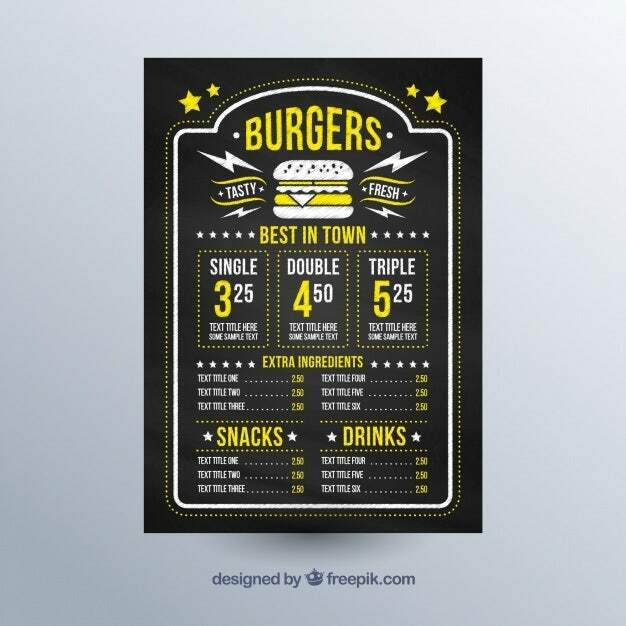 This Burger Brunch Menu Illustration is one awesome menu design you’ll definitely want for your burger joint or brunch cafe. Download this vector template for free and easily customize it with colors, images, or text to fit yoour own brand. If you want unique and elegant, this Round Wedding Brunch Menu in pink gradients is the one to use. Download this unique design with its easy customization and print-ready quality. It’s a great breakfast and lunch menu design for your wedding reception, bridal shower, or corporate event. Rustic chic is a well loved and in-demand theme for weddings and events these days. Get the Rustic Wedding Brunch Menu Design for the most important event of your life. It’s simple, elegant, and absolutely chic with its minimalist layout, dainty floral illustration and clean text. If you’re looking for a bridal shower menu design to feature your brunch meals, this Tropical Bridal Shower Brunch Menu should be a top choice. It’s utterly sophisticated and vibrant with its tropical and floral watercolor illustrations and romantic calligraphy script in gold to cap off the look. 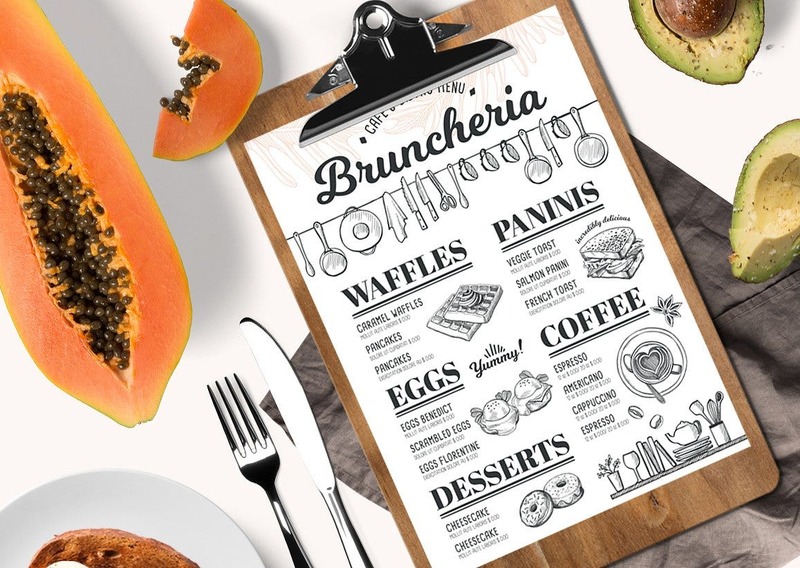 Make brunch even more exciting and fun with these brunch menu designs we’ve listed. You can download as many designs as you prefer and incorporate different elements and layouts to come up with a unique design of your own. Brunch menus are definitely a huge hit on cafes, restaurants, and even weddings. You can browse for sample wedding menus and other menu templates for more design ideas. What else are you waiting for? Dinner Menu Templates – 35+ Free Word, PDF, PSD, EPS, InDesign Format Download! 36+ Wedding Menu Templates – Free Sample, Example Format Download! 32+ Breakfast Menu Templates – Free Sample, Example Format Download! 41+ Valentines Menu Templates – Free PSD, EPS Format Download!